Hikaru Kudo is a sophomore journalism student at Michigan State from Novi, MI. 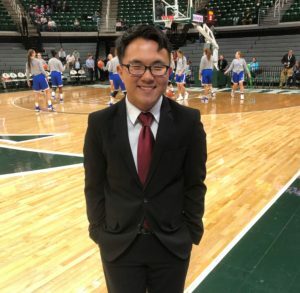 Hikaru is the Sports Broadcast Director and oversees all aspects of play-by-play, live or recorded, for any athletic event Impact may send staff to. He is also the producer of Impact Sports flagship radio show, "The Green & White Report". Hikaru covers soccer, volleyball, men's and women's basketball, and Formula One. Outside of Impact, Hikaru is a staff member at Big Ten Network Student U. In his spare time, Hikaru enjoys spending time with his friends and family.